to rally up for a science log when you are tired and many of have to pack to disembark at Jacksonville tomorrow morning. As for the Pisces and her crew, they will make their way back to Pascagoula for the Holidays. Our last day of ROV dives and it was definitely worthwhile. PISCES held off the coast of South Carolina at the Edisto MPA (Marine Protection Area). 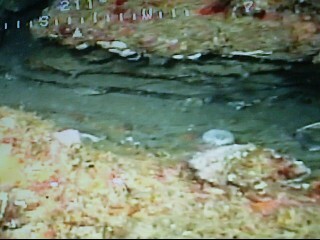 We were able to get in four dives with the ROV. The scientists paid close attention to the marine habitat within the ecosystems of all four dives. The interesting conclusion was that all four dives had very different habitats. What is even more interesting is that these differing habitats affect the number of animals that live there. Some of the areas we saw were smooth sandy bottom and interspersed on the smooth bottom are rugged rocky outcrops. The rocky reefs range in height from some being really short to some being very tall. 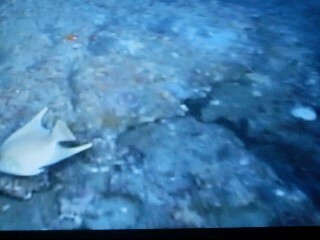 Some of the rocky reefs can even be in a small area the size of a dinner plate and others are hundreds of square miles. The important fact of the matter is that the rugged hard bottom is favored by many species of animals including corals, sponges, and other invertebrates. Scientists find that sunken ships or other debris that ends up at the bottom of the ocean becomes perfect habitat for animals. These areas protect fish species during spawning and from predators. Today’s discovery is that the most fish species we have seen was found not in the smooth sandy bottom but in fact in the rugged rocky outcrops and rocky reef ranges. NOAA’s mission is to “protect, restore and manage the use of coastal and ocean resources.” The way NOAA does this is through science – a voyage like this may seem like moving from point to point and placing a really cool piece of technology in the water to see what’s on the bottom – but these are all tools that are being used to be able to carry out the tenets of protect, restore and manage. We have visited half our sites now and have surveyed different environments in and out of Marine Protected Areas. Different environments, yet with commonalities – all the sites are near exposed “hard-bottom” or exposed limestone on the shelf bottom. There may be miles of sand waves and algae – but theses exposed, complex and bio-encrusted features are “oasis’s” for all sorts of ocean life – especially fish. 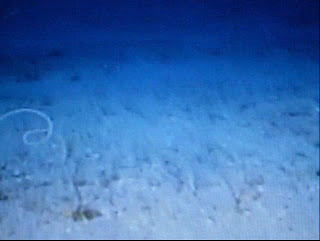 As the ROV maneuvers across the sandy waves, it is usually the glint of a school of fish or reflection of a fish eye that provides a beacon to a feature. If these features are “oasis” habitats then they should be protected. Granted, these limestone blocks can do more damage to fishing line and gear, evident in the amount of line found in the high relief areas – but in the case of some of the North Florida MPA, we encountered the fragile deep water Occulina Coral which is vulnerable especially when nets are being dragged across these areas. Another commonality noticed is the growing presence of the beautiful Lion Fish (Pterois volitans) – this native of Pacific waters was released intentionally or unintentionally in the early 1990’s around Florida and have since spread to areas above North Carolina and south to the Caribbean, especially along reefs and rocky outcrops. They join an infamous ranks of other invasive species including the European Green Crab, Asian Eel and Zebra Mussel. The Lion-Fish, besides having an array of venomous spines. has a keen strategy of “corralling” prey with their fins and eating them in one gulp. This will impact the small fish and crustaceans in these habitats as well as the added competition with indigenous or native predators such as snappers and grouper fish – which are currently commercially fished. This is where “manage” comes in – here is a “new” invasive species in that is growing in population and spreading geographically, impacting the habitat by out-competing, in some cases, the established predators – how can it be managed. Especially when the Lion-fish has few natural enemies. The Lion Fish is a tricky one – as an invasive species, missions like this one help to understand the long-term impact the Lion-Fish is having on these habitats. Using technology like multi-beam mapping and ROV technology can provide data for scientists and in turn give councils, commissions and government the knowledge to manage these areas through smart-solution-based policy. What an exciting day! The first time we launched the ROV (Remote Operated Vehicle) into the ocean at our first MPA (Marine Protected Area) in North Florida. The amount of manpower and communication that goes into something like this is just extraordinary. The deckhands must be available and working with the crane to gradually place the ROV into the water, the crew must be on the bridge communicating with the scientists and the deckhands to maneuver the ship where needed, and finally the scientists have to be working gathering data and making sure the ROV is placed where the MPA site is located. Even before the ROV is launched something called a CTD (Conductivity Temperature and Depth) is lowered into the ocean to gather water temperature, salinity, and depth. This CTD device is lowered twice in one day, once at the beginning of the day and once at the end of the day to give the scientists some raw data of the waters. The ROV will usually “dive” for about an hour while the scientists record live footage. One scientist is actually driving the ROV from inside the ship. The ROV has four propellers that run from an electric motor supplied by the electricity source provided by the ship. It almost looks like he’s playing a video game when he is driving. It’s got two joysticks and a monitor that he follows. Another job is where a scientist is keeping track of the 37″ TV monitor. He or she records the species of fish seen along with longitude, latitude, depth, and floor surface. Yet another scientist is working taking still and video photographs from the ROV while providing audio narration to aid in video analysis when reviewing back in the lab. All the above is going on and still don’t forget the communication between the bridge and the scientists. If the scientists want to move the ship just about 400m due East then he will radio up to the captain on the bridge and the ship will move 400 m due East being very careful not to run over the ROV or cause any other safety concerns. 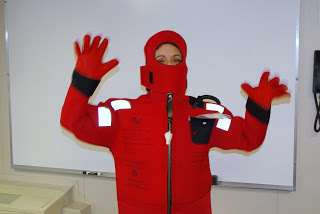 Safety is NOAA’s biggest concern! Look these up and send me a photo….. I’ll let you know if that’s what I see! We sailed last night to our first “station” – The North Florida Marine Protected Area – and by 7:00 am this morning the ROV pilots Lance Brown and Glenn Taylor were going through the “pre-flight” checklist on the ROV; Lance working the controls in the lab, Glenn outside taking care of the deployment and extraction of the vehicle on the starboard weather deck. Soon they were meeting with the Lead NOAA scientist Andy David to talk through the operations of the deployment and extraction and more specifically the methodology of what they were trying to accomplish at this site. The North Florida MPA area has been protected since 2004 – meaning no sailing or fishing occurs in this area. Some of the area has been mapped by multi-beam sonar – so what scientist then do with ROV technology is “Ground-Truthing” in which after examining the multi-beam maps – choose features to explore and check visually how they compare with their maps. Since the ROV sends real time video feed to the lab, the scientist watch and note the features, the animals that are present or not present in the habitat. They also perform a down shot every 2 minutes, or stop the ROV – point the camera down and take a picture – later in the lab they quantify the habitat by gridding the photograph and counting the number of species. Todays North Florida site tested sites inside the Marine Protected Area as well as sites/features outside the MPA for comparison as well as to help make future decisions of extending possible areas into the protective zone or even species. After the scientists met, the Pisces crew and captain Jeremy Adams met on the weather deck to talk through the operation – sync their communications and what if scenarios. In all, there were 3 ROV dives which went extremely smooth, mainly due to the organization and communication of everyone involved. The highlights of the dive were the spectacular features of the exposed limestone near the drop offs and the amazing habitats – for all my preparation the diversity of fish was overwhelming – I could identify a few featured fish like the Lionfish, barracudas and Moray Eels – I was unprepared to see a real sea turtle hanging out by some rocks or a Goliath Grouper which came out of nowhere. I learned many new fish which I hope to be able to call out from the monitor tomorrow like the Reef Butterfly, Squirrel Fish, Amberjack, Scamp, Soldier fish, Purple and Yellow Tail Reef Fish. I was helpful in identifying some of the Occulina deep coral species, the sponges (which you couldn’t miss) as well as pick out old fish line, a bottle and and an old anchor jammed into the rocks near the edge. I’ll let the pictures and video slices tell most of the story. We are cruising all night again to our most northern site Edisto – off South Carolina and then work back from there. Today we were ported in Jacksonville, FL. It was load up and set up day for the additional scientists and the ROV (Remote Operated Vehicle). The ROV is similar to a traveling robot that will be lowered down onto the ocean floor and will be remotely operated from the ship while recording ocean life at each MPA (Marine Protected Area) that we visit. 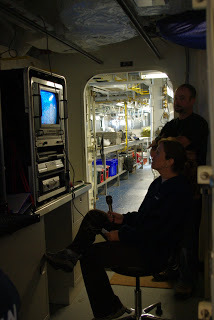 Since PISCES is a brand new ship she wasn’t equipped for all the hardware and software needed for the ROV; therefore, all the engineers, deckhands, scientists, and crew were involved in a speedy setup. The scientists also loaded a fish trap just in case we need extra data in addition to the ROV. We set off to our first MPA in North Florida to do our first ROV trial testing in the morning to get some live data. I am so anxious to see how the ROV works and what sort of data we will receive. I know I will sleep well tonight because I was working right along side everyone. Remember all those measurements I have you take and then convert them from English to metric units? That’s what I had to do today. We had to measure how far the equipment was in respect to the size of the ship, etc. You want to know how you will use what you learn in ‘real life’? Well, here it is! Also, I was able to watch the launch of the space shuttle Atlantis.